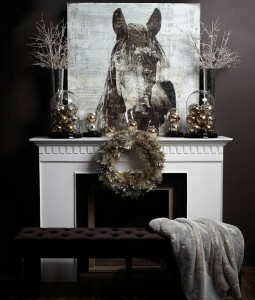 Welcome back to part two of our holiday décor series. This time we will explore Modern holiday decorating ideas to bring a chic twist to traditional holiday imagery. Add a modern twist to your holiday mantle and table this year by using traditional imagery in a non-traditional colour palette. 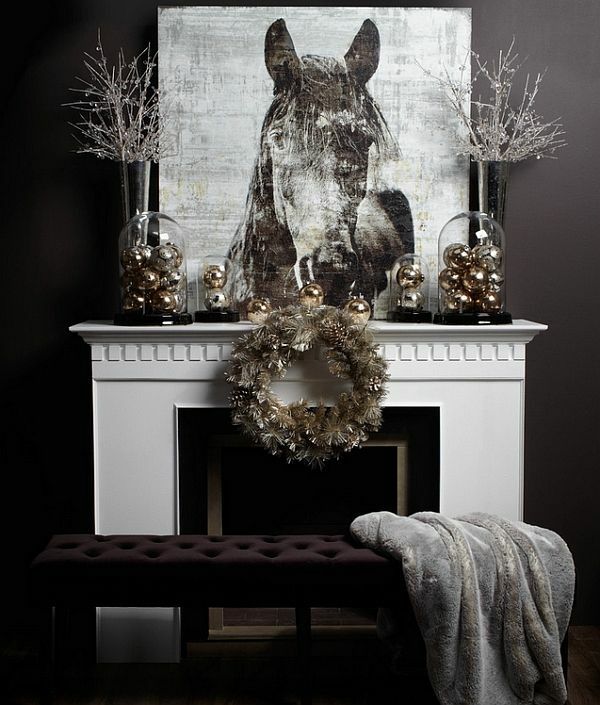 Mix cold and warm elements to balance your room and create a seasonal environment perfect for entertaining. This modern mantle uses simple gold and silver accents creatively displayed to bring sparkle and warmth to a dramatic black and white monochromatic room. When setting your table use fresh herbs, for example, rosemary or bay to create a natural table runner that can be accented with candles and provide beautiful seasonal scents and is a beautiful green alternative to traditional evergreen accents. 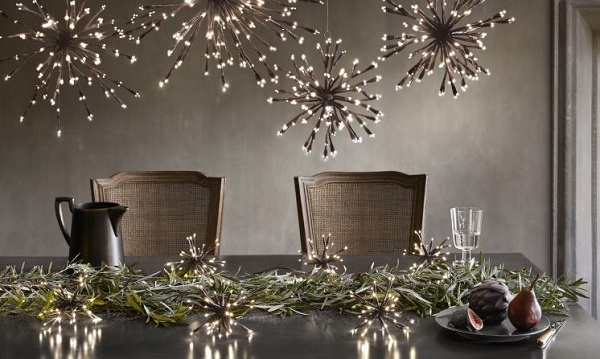 By adding creative lighting, it creates a peaceful environment for a beautiful holiday meal. 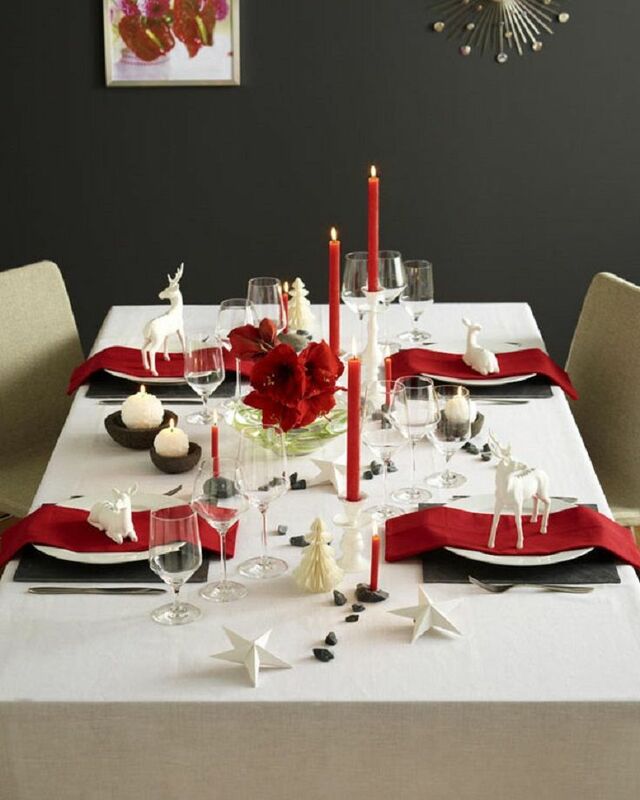 Use a traditional single colour against a modern black and white themed holiday table to create drama and add instant elegance to your holiday table. 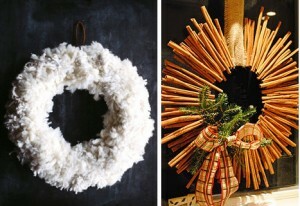 A traditional wreath or garland can be modernized with a few small changes including color or accents. Try adding dramatic feathers to a garland to create texture as well as visual appeal and dimension. 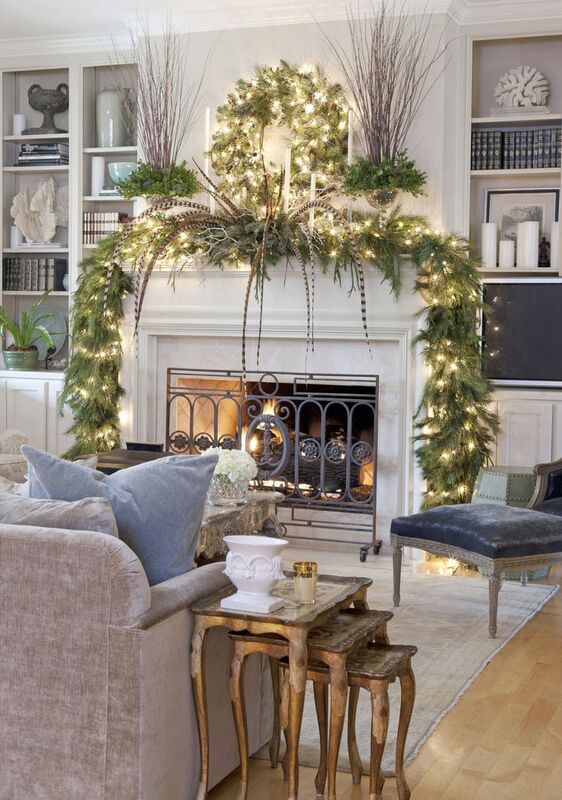 Sprays of branches bring balance and height to this modern meets vintage mantle décor. Wreaths are welcoming symbols of unity and peace that look wonderful on front doors and as a conversation piece above the mantle. This texture-rich Anthropologie inspired wreath can be customized to fit any colour scheme and is easy to make and brings a modern feel to the traditional wreath. Another DIY modern take on the wreath is the cinnamon stick starburst that is not only visually interesting it scents the room with the warm scent of cinnamon. Follow a pattern for a twig starburst and substitute cinnamon sticks in place of the twigs. Finish it off with a bow or greenery, or leave it bare for a modern minimalist approach. 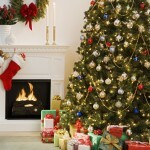 While a traditional tree is not necessary, it does create a beautiful focal point in any living room. Why not try some of these gorgeous tree alternatives? Try using wire forms or suspended ornaments to create a mobile and have your holiday centrepiece be a beautiful piece of art. Another popular trend this year is to use other types of trees to decorate the holiday landscape. Birch branches in their natural state or other types of branches painted to your preferred colour can be decorated with metallic or colourful ornaments and white LED lights to bring a cool wintery accent to your room. 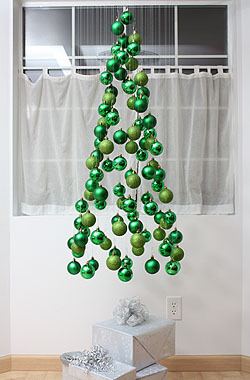 Suspended ornament mobiles can be set up in a variety of colours to match your palette. Wire, crystal ornaments and light give a beautiful glow and cast dramatic shadows with this tree inspired focus for a modern décor. 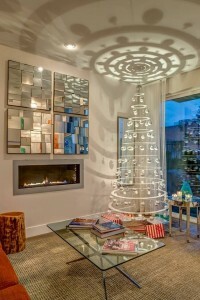 A non-traditional tree painted white and decorated with metallic and crystal accents when lighted cast a wintery glow on white room. What is your favorite type of holiday décor? See our Traditional Holiday Decor on a Budget in part 1 or join us on Facebook for more holiday decorating ideas.